Peplums seem to be one of those polarizing trends–people either love them or hate them. As for me, I think they’re adorable, sort of mini-dresses on tops or dresses. I have been wanting to get my hands on one for months, and I finally found this sweet dress…on clearance. 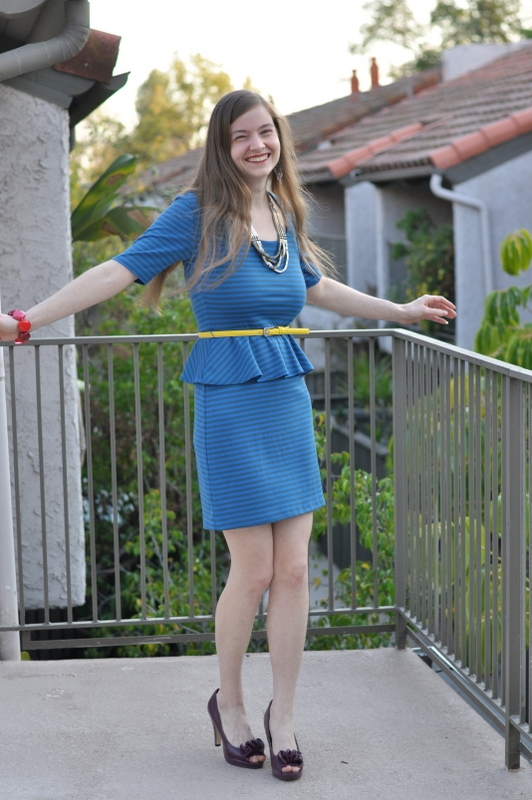 I love stripes, and the dress actually came with this lemon yellow belt, so I was doubly sold. I, of course, saw this as an excuse to trot out some of my favorite bright accessories, including this green envelope purse. These red earrings are new, and I love that they are shiny and slightly musical at the same time. My mom bought me this bracelet in Amsterdam and gave it to me for Christmas. I love its big shiny beads. They kind of look like gigantic cheery pills. 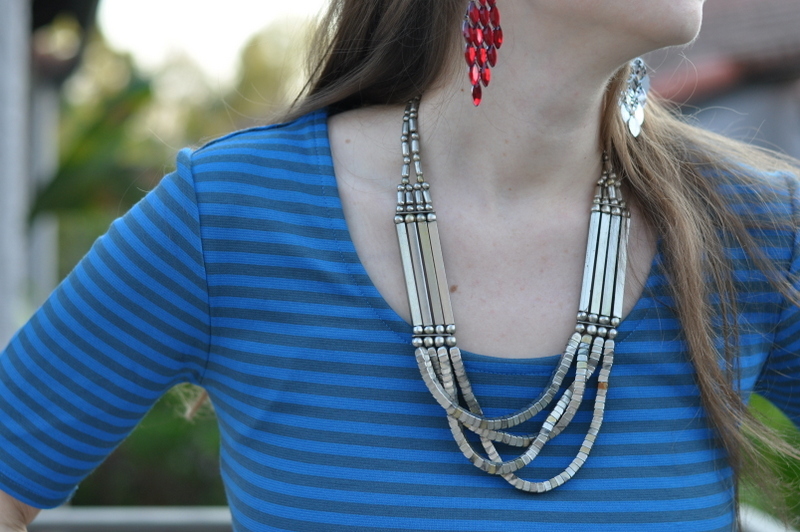 This necklace once belonged to my awesome aunt Ellen. I am trying to keep its legacy of awesomeness alive. I think one of the obligations of wearing a peplum is that you must be willing to spin around. I tried! Ah well, at least these shoes are really cute! I think this is going to be my favorite dress for quite a while. Here’s to after-Christmas sales! Precious! You really scored in the clearance sale department, not that I would expect anything less from you. Jewel tones are YOU, baby! Thank you! Wish you had been there to shop with me–it was a bonanza! I was delighted to see another style post this morning as I so love to see you featured in different fashions. I didn’t know what peplum was but it sure looks good on you! I love it, you look adorable, and I want one too. Thank you! It would be even cuter on you! Peplums always make me think of styles of the 30’s and 40’s, which I love. That dress is adorable! oK, I think I finally got the hint. You’ve been training your husband to be a fashion model photographer. Looks like he’s a fast-learner. Ha! No, he’s training me how to be a model! 🙂 He is always fantastic with the camera.